Your biceps and triceps are the main muscle groups in your arms. Developing them through triceps exercises ensures that you will be getting solidly impressive arms. Biceps only comprise one-third of your arm’s muscle mass. Two-thirds of your arm mass comes from your triceps muscles and developing both biceps and triceps are a solid goal for anyone trying to build an impressive physique. A triceps workout routine is not easy to put together though. A lot of the exercises focused on the arms confuse the biceps and triceps. However, building your triceps is pretty essential. This is because they can contribute a lot more power to your arms. Well-developed triceps means that your arms will be able to carry more. Before you start your triceps workout at home, you’ll want to learn more about this muscle group. It’s scientifically called the triceps brachii. It’s the large muscle at the back of your upper limb. It physically connects your humerus and scapula bones. Though it may seem like just one big muscle, it is actually composed of three separate pieces. Like the bicep, they are each called heads. First, there is the most important section, the lateral head. This is found on the outer side of the humerus and what people want to mainly develop. Second, there is the medial head that is found in the middle portion of the arm. Finally, the long head, which compromises the majority of the triceps. First, it acts as the extensor muscle for your elbow joint. This means that you use it to straighten your arms. Second, it’s also used to bring the arm closer to your body. So triceps workouts with dumbbells usually involve movements that involve elbow movements. The trouble is that people sometimes neglect their so they are not as strong as they could be. If you really want to get big triceps, you will need triceps workouts for mass, and the accompany it with the proper diet. Before you start working out, you will need to have a proper diet specifically for this purpose. You may be doing the best triceps exercises for mass, but they won’t be as useful without the material for it. That’s why you will need to outline your dietary needs for your triceps development. There are two things that you might need from a diet: fat reduction and muscle building. To do that you’ll need a diet that cuts down on your calories and also boosts your muscle generation. Calorie counting is important in both instances. This is because calories are what becomes fat deposits, lower calorie intake means your body will take from your fat deposits, and bigger muscles require more calories even when resting. This is why the first step is to just calculate the calories that you are going to limit yourself to. There are quite a few online sets that already calculate your caloric needs. Use these as your baseline. If you plan to workout, you will need an extra 500 calories since your body will need that many calories to keep fueling your muscles even at rest so that they continue to grow. Calories are your main metric, but you’ll still need to divide them into various food groups. There are three food groups that you will need. First, you are going to need protein. Protein is the main fuel for muscle-building and operation. Most people think that this means they need to eat red meat. However, healthier animal proteins can come from fish and chicken. You can even get protein from beans. Second, you’ll want to add fats. Healthy fats and not saturated fats. You can get these from oils like canola and olive. Fat makes food tasty – but they are also a great source of energy. Fat is burned first before protein, so this means you’ll still have protein reserves left for muscle-building. 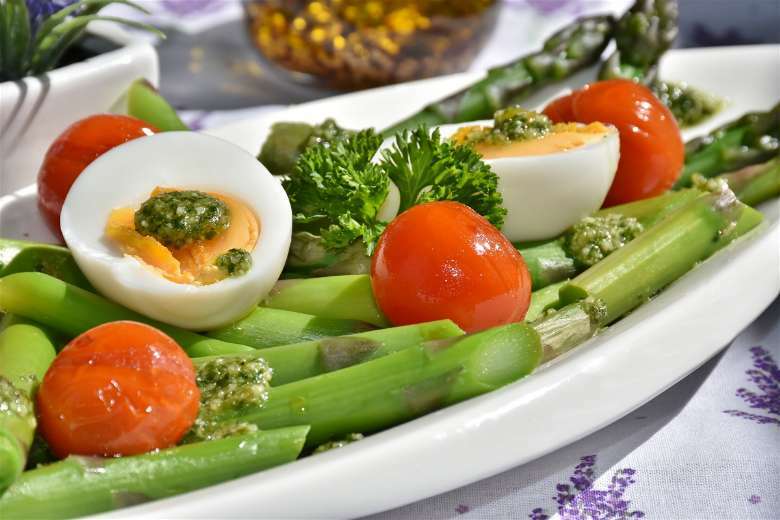 Additionally, healthy fats let you absorb vitamins and nutrients better. Finally, your body needs carbs. Carbohydrates from whole wheat bread and other cereals are what your body needs to perform better. With carbs in your system, your workouts are easily done, and you’ve got energy left to carry you through the day. Now that you’ve got a decent diet to back up your triceps regimen, you’re going to need to learn the right exercises to do the job. Triceps exercises for mass have to focus on three different areas. This is because the triceps are made up of three separate muscles. To properly develop them, you are going to need different exercises for each. Let’s take a look at some exercise you should be doing. Though tricep exercises with dumbbells are easier to do, you will want an exercise that really pushes your triceps to the limit. 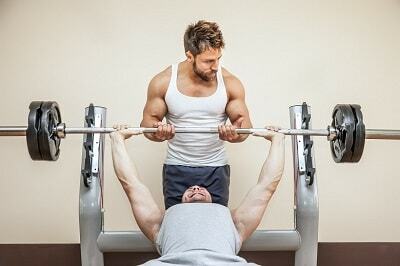 One good example is the bench press. This is actually a pretty simple exercise. You just lie back on a bench, and you have a barbell to push up. This extension is the main motion to build your triceps, specifically the “lockout” at the end. However, to get the best results, you need to do the exercises properly. This means the barbell needs to be around your chest area. 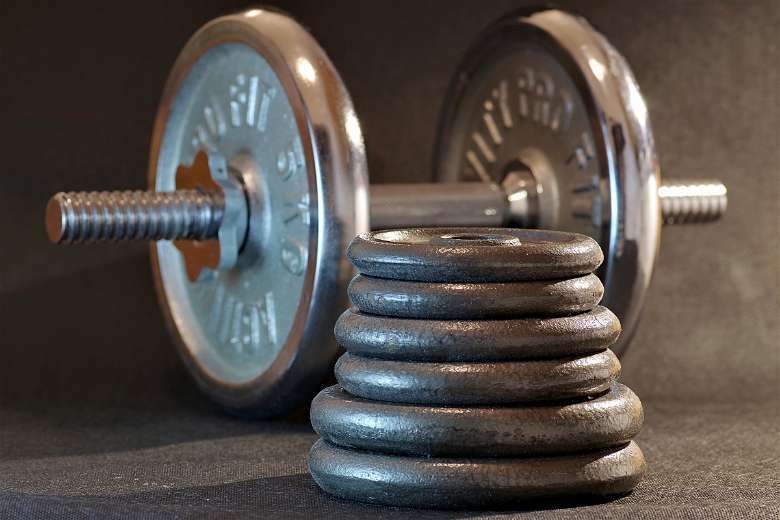 You also need to have your muscles active at all times – no resting the barbell on top of your chest. The barbell needs to stop a few inches above it, and you start pushing up. Don’t limit yourself to just holding the barbell at shoulder-width though. Moving your hand’s position on the barbell can affect how the exercise will affect your triceps. For example, a close grip on the barbell, with your two hands closer to each other, can result in more work for your triceps. This is good if you want to challenge yourself. One of the better triceps dumbbell exercises out there is the triceps curl. Just like the biceps curl, this exercise targets the triceps muscles and has them completely active. The process is simple. You grip the dumbbell so that its sides are facing your side. You then raise it straight up. You then lower the dumbbell while your arm is locked, dropping the dumbbell behind your head. This works your triceps and the accompanying stabilizer muscles. Alternate reps on both arms so that both of them get the equal treatment. The next exercise that should help develop your triceps is the tricep dip. You are probably familiar with the dip. 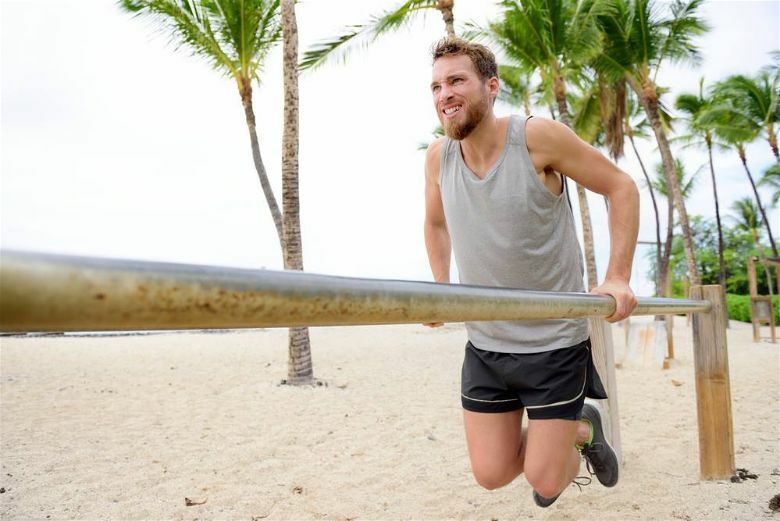 In this exercise, you hang from two bars and lower yourself down to a certain level. The usual dip has you leaning forward, focusing the effort into your lower pectorals. A triceps dip stops that lean and forces you to drop straight down. You then push yourself up. This movement forces all three of your triceps to do a major effort. You can even make it harder by adding a bit more weight on yourself. Overall, this exercise will be a challenge to your triceps. Be careful though to stretch a bit beforehand. If you don’t, you may end up with a triceps injury. You’ve seen the cable machines at your local gym. These can greatly help in improving your triceps via the simple pushdown. The movement is pretty easy. Just find a cable machine, get a grip on the bar and push down on it until the weights reach the lockout position. If that seems pretty easy at first, you’re going to need to add more weights. Other variations for pushdowns include grips on the bar, how far you are from the machine, and more. Remember that you are not pulling the bar but pushing it down – these work for different muscle groups, so it is important to know the difference. The next exercise you should focus on is overhead extensions. You’ll want to perform this exercise a lot since this is the only true stretching exercise for your triceps. Other arm stretches are focused on the other arm muscles. The movement is pretty simple. Start with the dumbbell raised high above your head. You then dip it until it is positioned behind your head. You will feel a stretch in your triceps. When that happens, return to the original position. This can be done with one hand or both at the same time. These are just a sample of the possible triceps exercises out there. However, these should be enough to help you target your triceps for developments. The real gem among them is the bench press and adding it to your workout regime will give you a solid triceps exercise, even if you don’t add anything else. Don’t stop in looking around for other triceps exercises though so that you can mix it around and so you don’t end up being bored. Knowing the exercises is just one part of the equation. You will also need to know what to do between the exercises. Exercising your muscles is just one part of the equation. If you really want the best results from your triceps workout, here are some tips that you need to remember. For muscles to grow, they will need time. This is why you’ll want to alternate your tricep workouts. For example, you will exercise your triceps well on one day. You then do not exercise for a day. A single day is enough to give your body a chance for the muscles to grow. If you do not, then your body will always be out of energy to develop the muscles. Going without rest is also a part of your workout. Pre-exhausting allows your muscles to grow better. The way to do this is to do a heavy isolated workout like pushdowns and follow it with a compound workout like a bench press. This forces your muscle to get used to the movement and making them grow when you are at rest. Another thing to remember is to go for heavyweights. Multiple reps are great for cardio training and endurance. However, if you are building your strength, you need more resistance. This is exactly what heavier weights can do for you. 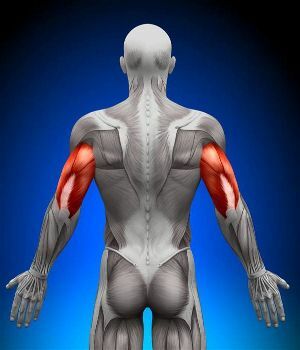 The triceps are made up of three distinct muscles. Each of these is in a different position, and though a few exercises do work all these muscles, some of them are neglected over others. If you want equal development, you will want to alternate your grip and exercises so that all of them get the same amount of attention. Check out exercise variations so that you can ensure this. Another problem that many exercise performers face is that they do not do the exercise properly. To get the full effects of any triceps exercise, you should do it in the right position and do it cleanly. No shortcuts or slacking off. These tips are just a few pointers. 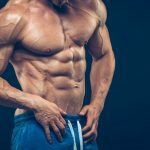 There are even more advanced techniques that can help you develop your muscles solidly. Your triceps are an important muscle group. With them comprising two-thirds of your arm muscles, this means they provide a lot of the strength in your arm. If you want to be stronger, then your triceps are the muscle to bulk up in. It also helps in making you look good. Biceps may be the main attraction of the “gun show” but your triceps help present your biceps properly. Additionally, there’s nothing more impressive like your triceps forming a horseshoe shape when you show off your arms. With the information above, you’ll know enough how to sculpt your arms into the right size. However, you’ll need to put a whole lot of effort to get these results. Don’t expect results until at least a month. By then, you’ll have some definition. To get the best results though, better stick with your regimen for half a year or so.